By 1927, the Republics of Latvia and Estonia had nine years of independence behind them. During these years, the governments of these two countries had reoriented their trade towards Western Europe, exporting agricultural and timber products, principally to the United Kingdom, and importing modern technology, primarily from Germany. Estonian and Latvian vessels plied the briny Baltic and the frigid North Sea, responding to the British demand for bacon, butter and wood. One idea they brought back that year from the British Isles was the Indian game of carrom, which became the basis of the national game of the two northernmost Baltic States. 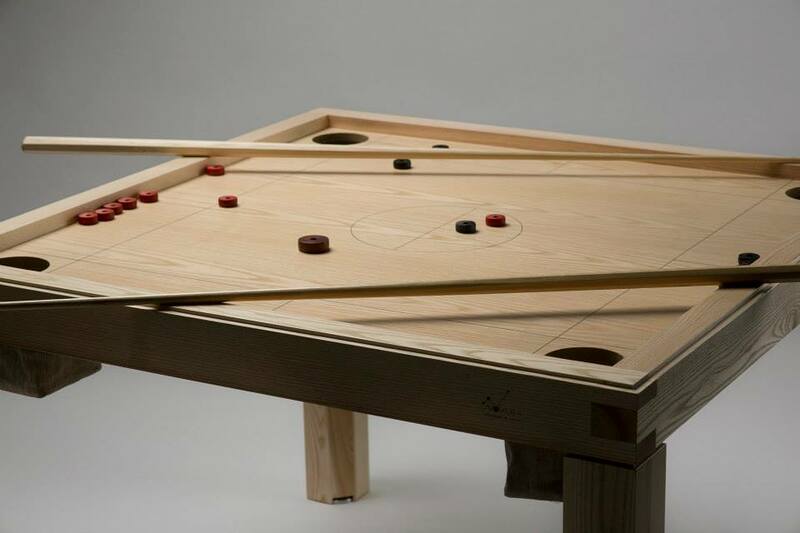 Novuss (in Latvia) or Koroona (in Estonia) is a two or four-player game, played on a wooden table, most commonly made of birch. The game is sometimes known as ‘sea billiards’, in acknowledgement of not only its maritime origins, but also the object of the game: namely, to sink eight wooden discs into the four pockets in each corner of the table using a cue and a big wooden disc. It initially served the role of entertaining sailors on their voyages, as the flat wooden discs stay firmly in place on the table during stormy weather on the high seas, but it was quickly adopted by the residents of four major Baltic ports: Liepāja, Ventspils, Rīga and Tallinn. The game caught on, and by the outbreak of World War 2 was played in tournaments and competitions throughout the region. The rules of the game were first standardised in 1932 (as was the size of table, which was initially smaller in Estonia than in Latvia). I have been living in Latvia for the last 6 years, initially in the capital, Riga, and now in the city of Liepāja, on the west coast of the country. I only found out about Novuss by chance, at a nursing home in Līgatne (which happened to have an emergency bunker for the elite of the Latvian SSR underneath it). I was intrigued by this game, and asked my friend what this game was. Matter-of-factly, she told me the name of the game. My mind drew a blank. It was only that evening, when I researched the game that I found out that not only was it from Latvia, but that it also hailed from Liepāja, the city where my grandmother was born. The roots of this game in England (the country of my birth) also made me feel an affinity with Novuss. This game is often found dotted around the countryside, in old summer houses and cultural centres. Sadly it is not a foregone conclusion that you will encounter this game on the streets of Tallinn or Riga (unless you know where to look), although this was not always the case. During Soviet times, every courtyard would have impromptu Novuss/Koroona tournaments in the summer months. Companies would have their own teams and newspapers would have news on tournaments/leagues throughout the USSR. But, as for a great many things which were popular in Soviet times, the 1990s were a rude awakening, a time when the old and familiar were swept away for the new and exotic. Sadly, darts and snooker became more commonplace than Novuss/Koroona, even in its home ports. It remains to be seen what the future holds for this game. Some argue that its best days are behind it, that progress dictates that new is always better. I am inclined to disagree. Novuss today, as in the past, still provides a role as a social lubricant, a non-verbal means of interpersonal connection, a necessity in what is generally acknowledged to be one of the most reserved and reticent parts of the world. Crucially, one of the biggest challenges for the Latvian state, that of emigration, could prove to be a blessing for a game popular amongst its citizens. Just as Latvians leaving their homeland in the 1940s introduced this game to North America and Australia, the new Latvian diaspora could now popularise this game in Western Europe at large. The mere existence of such a game serves as a reminder not only of the ties between the Eastern Baltic littoral and Western Europe, but also of the spirit of another epoch. The 1920s were an unparalleled decade of progress, peace and prosperity in Europe, a period that Latvia and Estonia were able to take advantage of, and contribute to. This game still stands as a mute reminder of that age. Geoff Chester is the owner of Novus Novuss, a company seeking to modernise and popularise Novuss/Koroona in the urban environment. If you feel the urge to try Novuss/Koroona, you can check out the rules at novusnovuss.eu and contact us for advice on where to find this game in Latvia. Not often you come across a new game. Fascinating. nice to see that someone has found my video useful! I grew up with a Novuss table in my house. I didn’t know about the Maritime origins. Makes sense, having played the game. If it was out, people used it. Latvian or not. It’s a very fun game. Easy to play, but hard to master. Games can be fast and intense with longs runs of shots. Like billiards, some are better than others with the angles. There always seems to be laughter and joy around a Novuss table. That table still gets brought out on holiday get togethers for all to enjoy. Older generations pass the game to younger ones. I love Novuss. Long live Novuss! Nice to find out about the origins! In my childhood we played it a lot. I don’t know about it’s popularity elsewhere, but there are still very passionate tournaments among ad agencies employees where I used to work. The Filipino variation of this game is sometimes called Pinoy Pool. They use roughly the same table, but it differs from Novuss because they use the rules from regular pool, including the initial break and sometimes numbered discs… it’s really interesting! Sometimes the square tables are built on a swivel so you can turn the table to make shots– this lets you put the table in a smaller space or even a corner.